Caterpillar recently announced changes to its high-production asphalt paver line that results in two new 10-foot-class models. Powered by a new 224-hp Cat C7 engine with ACERT technology, the wheeled AP-1000D and tracked AP-1055D asphalt pavers have a Cat-exclusive material-handling system that utilizes the machine controller to precisely control the augers and feeders, as well as calibrate and monitor material handling. The AP-1055D model can be fitted with a steel track undercarriage, or with a Mobil-trac undercarriage that combines the traction and flotation of a crawler with the speed and ride of a wheeled machine. Product-line features: With Cat's material-handling system, the ability to control each of the left and right augers and left and right feeders independently eliminates the need for the D-Series asphalt pavers to have feeder gates. Rather than raising or lowering gates to control material volume, the feeder's speed can be set to provide the precise material volume needed to the augers. Late in 2006, Ingersoll Rand rolled out one new track-mounted and two wheel-mounted models as part of its PF-6000 Series of highway-class asphalt pavers, each featuring an auger system independent of the conveyor system. For more precise handling of material, four sensors are now located on the feed system, specifically one on each of the two conveyors and two augers. The conveyor system has chains that are automatically tensioned. The PF-6000 Series machines have dual control stations, each of which rotates and pivots at two points for comfort. Each seat can be extended beyond the edge of the machine for improved visibility. Product-line features: The PF-6000 Series pavers will accommodate a variety of fixed and hydraulically extendable screeds, allowing the paver to place a wide range of materials, from stone mastic asphalt and roller-compacted concrete to non-treated and cement-treated base. Contractors may, as such, cash in on the versatility of owning one tractor with a multitude of screeds. A renowned brand in commercial-sized asphalt paver production, LeeBoy moved into the highway-paver market earlier this decade with the introduction of the 8816 model. A 25,000-pound, 130-hp paver designed for roadway and large commercial applications, the 8816 can pave base material or asphalt topcoat up to 6-inch depths at infinitely variable widths from 8 to 15.5 feet. Product-line features: With the new Legend Electric Screed Heat System as an option, the 8816 gives paving contractors an alternative to propane as the heating fuel source. Powered by an on-board generator, the Legend Electric Screed Heat System offers the safety benefit of no flame, fuel or fumes in the screed heating process, along with consistent temperature control of the heating elements across the width of the screed plate and screed extensions. 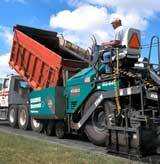 Vogele America offers five lane-width asphalt pavers, all designed and built in the United States. There are three rubber-tired models — the 2111W and 2116W in the 8-foot class and the 2219W in the 10-foot class — as well as the rubber-tracked 2116T and 2219T models in the two size classes, respectively. These five asphalt pavers are served by four Vogele America screeds, collectively offering a choice of electric and diesel heat in both machine size classes. All screeds offer hydraulically extendable extensions. Product-line features: Depending on the size of screen mounted, each Vogele America model will pave 10-foot-wide sections. To ensure a longer and more reliable life in the rubber track bands, the cables were beefed up, increasing track strength by 50 percent. The track frame was likewise bolstered to enhance rigidity, longevity and alignment. Uniquely, Vogele America has mounted the drive motors on the outside ends of the torque hub. Should a leak in a seal or hose occur, it will be immediately visible. Dynapac's most recent asphalt-paving innovation allows the simultaneous laying of the wearing and binder courses in a single pass. Known as Kompact Asphalt Paving, the process allows "hot-on-hot" monolithic pavement to be laid simultaneously in a single pass by a Dynapac F-300 C/S twin-paver, featuring two hoppers. The upper hopper, at a capacity of 25 tons, holds the wearing course. Holding the binder course, the lower hopper has a 45-ton capacity. Product-line features: With the F-300 C/S twin-paver, two screeds are fed by the two different hoppers. The first screed has the ability to place the binder course while compacting it to a density of up to 97 percent. The second places the top course directly over the freshly placed binder and compacts it to 92-percent density. This model joins the 8-foot F 121 6W wheeled paver and F 141 CR rubber tracked paver models available in the United States, the latter of which is capable of working with screeds up to 10 feet. On top of its established 8-foot and 10-foot rubber-tired and rubber-tracked asphalt pavers, Roadtec added a fifth full-sized model with the SP-200 Spray Paver. At a shipping weight of 62,500 pounds equipped with an Eagle 10 screed, the SP-200 sprays tack and then applies hot mix asphalt seconds later, thus combining spraying and laydown for a high-quality mat with a strong bond between layers. Roadtec has also redesigned the 10-foot RP-190 and RP-195 models with slideout operator stations for better visibility. Product-line features: The redesigned 10-foot RP-190 and RP-195 models utilize Caterpillar Tier 3 engines, which run at 1,800 rpm, providing a 4-percent gain in fuel economy and a 5-percent decrease in operator noise. The 90 Series pumps run at the bottom of their engineered range for cooler operation and longer life. With the ability to be used as both a material transfer vehicle and a paver, the new Terex Cedarapids CR662RM model by Terex Roadbuilding significantly increases utilization rates. As a paver, the CR662RM features a new style of outboard auger drive, replacing the center gearbox design. This eliminates the chance for centerline segregation, thus improving mat quality. Also recently introduced, the CR300L Series paver models offer more highway-class features than traditional 8-foot-class machines, including a longer receiving hopper. Product-line features: The CR662RM features a new generation of the Remix Anti-Segregation System, in which constant 12-inch-diameter augers with a variable pitch are able to draw material down throughout the entire shaft length. The counter-rotating augers aggressively reblend the material to reduce both thermal and particle segregation. Material is pulled from all areas of the hopper, providing a more homogeneous mix.